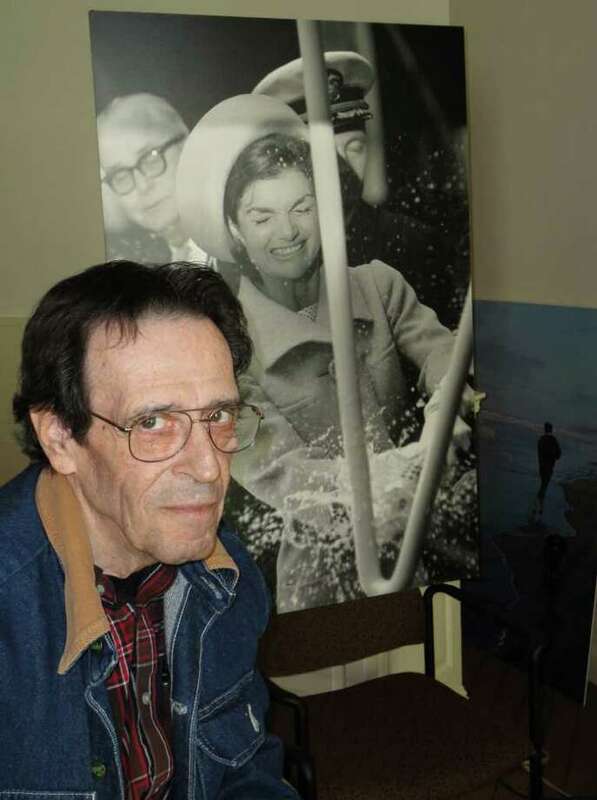 Legendary photojournalist Bill Eppridge sits before a poster-size print of his photo of Jacqueline Kennedy smashing a bottle of champagne on the hull of a submarine during christening ceremony in Groton. A retrospective of his work is on display at the Fairfield Museum and History Center. The world has sibling rivalry and a bit of teenage rebellion against authority to thank for some of the most iconic photographs of the 1960s and beyond. And many of those photos by the renowned photojournalist Bill Eppridge are on display in an exhibit that opened Sunday at the Fairfield Museum and History Center. Eppridge's father, a chemical engineer, was not keen on his son becoming a photojournalist. But the young Eppridge's interest in gadgets led to tinkering with the family's camera and his desire to outperform his sister -- who he called "a pretty fine artist" -- led him to a front-row seat to history in the last half of the 20th century. Among his iconic black-and-white images are: the arrival of The Beatles in the United States; key moments during the civil rights movement in the South; the Vietnam War; Woodstock; the Exxon Valdez oil spill; and six winter and summer Olympic games. A retrospective of Eppridge's work headlines "Images 2011," the Fairfield Museum and History Center's third annual photography exhibit. It runs through Aug. 28. In addition to Eppridge's photos and some of his artifacts, the show includes a juried exhibit of 70 photographs by professional, amateur and student photographers from the region. Eppridge has worked for Life, National Geographic and Sports Illustrated magazines, and millions would recognize his most famous photos without knowing who took them. "There's probably one I will be remembered most for, but it's not my favorite -- by far it's not my favorite," said Eppridge, who lives in New Milford. The photo is of a mortally wounded Robert Kennedy lying on the floor of the Ambassador Hotel kitchen in Los Angeles immediately after he was shot. "That one seems to have taken on a life of its own," Eppridge said. Eppridge said he has many favorites among his work, though "It's hard to say what my favorite is." When pressed, he chose a photograph that ran on the cover of Life magazine of Kennedy with a portrait of his brother John behind him. "That's one of them. God, there are others. I mean, even some of the ones I'm making today I like a lot," Eppridge said. His more recent color studies of the vernacular architecture of the barns in the northwest corner of Connecticut also are included in the exhibit. "Right now, I'm doing a lot of grab shooting. I'm a street shooter and just grabbing things as I see they're happening," said Eppridge, who never leaves home without a camera. Even as he arrived at the museum last Wednesday to deliver some of his belongings for the display, Eppridge could not resist stopping to photograph a squirrel peeking out from behind the base of a tree, its backdrop the super-sized image of an Eppridge civil rights photo hanging on the front of the museum. Inside, one wall is dedicated to photographs Eppridge took on June 4, 1968, the day of the California primary during Kennedy's presidential bid. "It's his entire narrative of Kennedy's crescendo to his assassination," said Kathie Bennewitz, curator of the exhibit. "On our labels that accompany these photographs of Bobby Kennedy, we use Bill's words to tell the story minute by minute, unfolding this horrific event." Display cases hold some of Eppridge's personal items, including his key from the Ambassador Hotel, campaign buttons, campaign credentials and some of his cameras. As one of the judges of the exhibit's other photos, Eppridge said the entries were "a lot better than I expected -- a lot better by a whole lot. "It makes you start hearing footsteps. If you know football, you know what it is when you start hearing footsteps. It means there's people coming up behind you real quick," Eppridge said. But he's grateful to have those chroniclers. "We're at a really heavy point with this country right now, and I think that any documentation that's made of these times and these years is going to be extremely important in the future -- whether it be film, whether it be words, whether it be photographs," he said. "We're at a turning point, and I think we'll never go back to what we were. Politics are taking us in a totally different direction, and it's not a good direction." The juried show attracted entries from about 400 photographers from Connecticut, New York, Massachusetts and Rhode Island in several categories, including landscape, nature, abstract, architecture, and Eppridge's specialty, photojournalism. Eppridge attended a reception at the museum Saturday evening and will return on May 19 for a 7 p.m. program called "A Man and His Camera: A Night with Bill Eppridge." The Fairfield Museum and History Center is at 370 Beach Road. For information on exhibit-related programs, call 203-259-1598 or visit www.fairfieldhs.org.